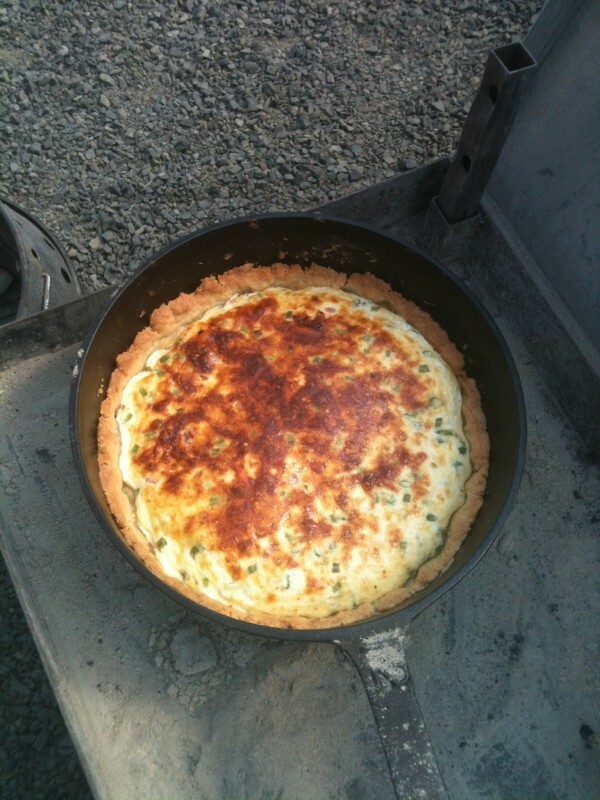 Dutch Oven Sunday Morning Quiche – Ready to serve and enjoy. Not only do I like to make and eat quiche in my cast iron Dutch ovens, one of my favorite cookin’ stories involves a bunch of Texas cowboys and this recipe we call, “Sunday Morning Quiche”. ** If you’ve ever driven from San Antonio to Fort Stockton, Texas, on I-10 you’ve driven through Ozona, Texas. In the early 1990’s we were teaching a Dutch oven clinic at the city park there with about twenty Texas cowboys, and some oilfield workers attending. I’ve never seen so much finger pointing at a clinic as when my wife Penny announced to the guys on Sunday morning that one group would be making quiche. I think deep down they all wanted to try it but because of peer pressure they all wanted someone else to make it. The quiche of course turned out great and there was a smile under every cowboy hat. Everyone who has tried making pie/pastry crusts know it can be difficult and requires a substantial learning curve to get them just right. The crust we use for the quiche recipe is all but fool proof as well as being very flaky and tasty! The crust as given in the recipe is enough for two 9″ pie pans or can be rolled/pressed out enough to fit in a twelve inch Dutch oven. 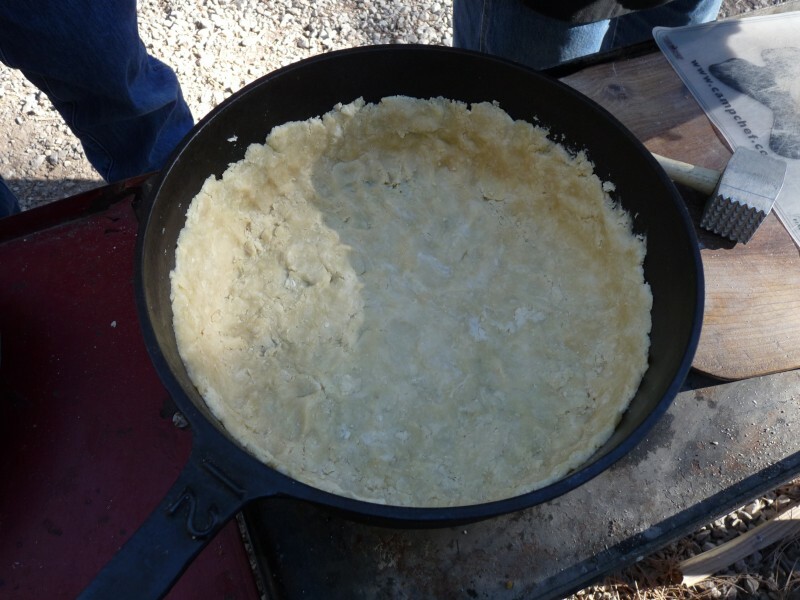 We chill the dough for 1-2 hours before rolling/pressing into the Dutch oven and we do not pre-bake the crust. We add another 3-4 briquettes underneath the Dutch oven and bake for 35-45 minutes. Chopped cooked bacon, ham, etc. mushrooms, crab, shrimp, sun dried tomatoes, fresh spinach. precooked crust and brush with melted butter or olive oil. Combine other ingredients for filling and pour into crust. lid. Let stand 15 minutes to cool. ** Real Men Don’t Eat Quiche, by American Bruce Feirstein, is a bestselling tongue-in-cheek book satirizing stereotypes of masculinity, published in 1982.